CHESTERMERE – Ah the joys of spring, grass turning green, leaves on the trees forming, flowers climbing out of the flowerbeds after a long winters rest and of course, birds chirping. Nature is grand. However, sometimes nature can take on some undesirable elements too; think mosquitos, flies and spiders. These are just some of the delicious insects that the chirping birds dine on. It’s hard not to associate spring with birds and their newborn. However, as in the picture above, not everyone loves to see the birds and their offspring. These pictures were taken from the deck of a Chestermere resident in the Cove. His deck is a perfect place to view the birds building nests at his neighbours’ house. It shows a number of birds nests, perhaps as many as 20 on this side of the house alone, and they have taken up residents under the eaves. 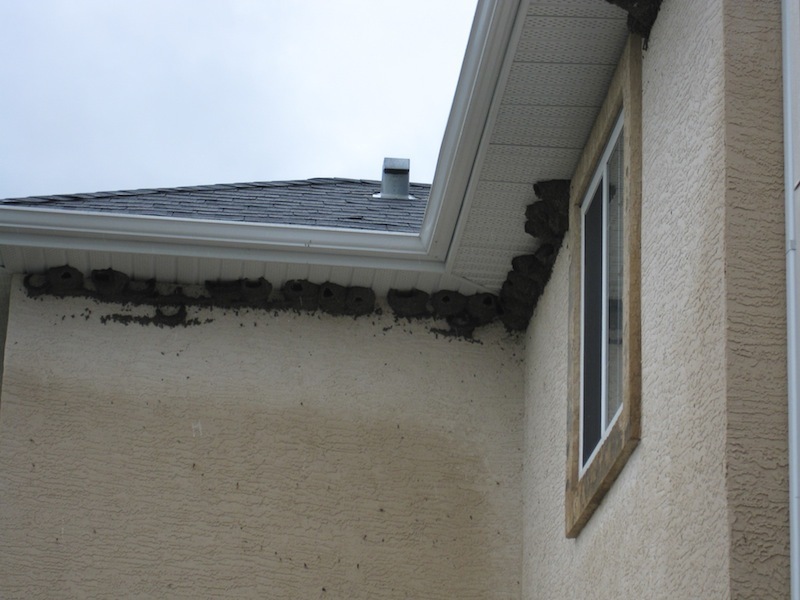 The birds (barn swallows I’ve been told) have brought mud and stuck it to the stucco on the house. These nests were rebuilt within a week as a previous wind and rain storm knocked several of them down and washed them away. The resident has been patient but still quite concerned for his health and the health of his 2 pets. He said, “We don’t put the dog or cat out in the yard because of all the mess the birds have left behind and we’re certainly not going to sit on the deck and have dinner”. So at wits end, he began to call a number of places such as The Chestermere Town Hall, the Peace Officers, Public Health Board, the Inglewood Bird Sanctuary, a pest control company and finally the media to see if something could be done. He also spoke to the neighbour whose eaves have been invaded and although the neighbour doesn’t want them around either, they don’t want to pay to have them removed. According to The Calgary Wildlife Rehab Society (CWRS) they said, “our philosophy is live and let live”. As well, “technically speaking, once the birds have nested and eggs have been laid, it is illegal to remove them”. Of course, you would have some pretty angry birds if you tried to remove the nests at this point in time. Two to three weeks from now and the offspring will have moved on to greener pastures. Some preventative measures offered by the CWRS that you could take before the situation gets to this point – purchase an imitation owl and perch it on your property; the owl is a predator to this and many other birds. This type of bird doesn’t like a flapping piece of foil or anything that makes noise such as a wind chime. Below is some information from a website (http://www.ehow.com) on how to prevent birds from nesting on a house. Monitor the nest activity daily. A nest with eggs or recently hatched birds should not be moved. Birds will not look for a nest that has been moved, and will simply abandon the nest. Moving a nest will mean certain death for the offspring and is often illegal. Birds are protected under the law. Block the opening or access point to the nesting area. Eaves and other areas around a roof are commonly used areas. Use wood, canvas or other materials that will prevent the birds from nesting. Obstructing the space must be done immediately once there is no activity near the nest. Purchase bird netting from home and garden suppliers. The netting will not allow birds to pass through, and it can be used in eaves that are too large to block off with wood or metal. Birds will not get caught in the netting; it is produced specifically to stop birds from nesting in specific areas. Only use approved bird netting—other types can entangle the birds and be hazardous to their safety. Capping chimneys will deter birds from nesting there. Chimneys are common places for nesting to occur. Once the birds can be heard, the nest has been built and the eggs will soon be hatching—at that point it is illegal to remove the nest. Cap a chimney in the late fall or winter months to prevent early spring nests being built on the opening. Call a professional chimney sweep to clean the chimney of debris and place a stainless steel cap on the chimney. Chimney Swifts, a common bird from South America, return to the same chimney to nest each season. Make sure to tell neighbors the chimney is being capped—the Swifts may choose to nest at a nearby location once they discover there are no feasible nesting sites at the former location. Make loud noises to startle the birds and encourage movement outdoors. Several companies manufacture bird alarms and visual simulators that show flashing lights. Tactics involving lights and sounds will only work for a limited time, until the birds acclimate to the adjusted surroundings. The scare tactics must be used for three to four days. Spraying chemical repellents and other materials against birds is often illegal. A gel-like repellent can be placed on the landing area. Most birds will find the area too sticky to perch on and will look for another nesting area. However, with a heavy population of birds, the gel will not remain sticky for a lengthy time. Grape flavoring, or methyl anthranilate, can be sprayed onto trees, shrubs and other nesting areas. Again, each method may be legal for only certain species of bird. Check with your local wildlife authorities for specific laws and regulations.